State Treasurer Andy Dillon led Bing entourage at City Council Oct. 22, 2012. He justs wants a “few more” pounds of flesh (LOL). 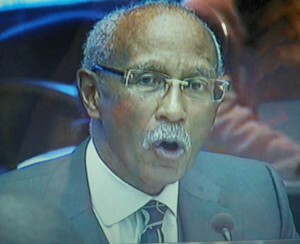 Detroit Mayor Dave Bing lays down the law at Council Oct. 22, 2012. DETROIT— Mayor Dave Bing brought State Treasurer Andy Dillon, Financial Advisory Board (FAB) Chair Sandra Pierce, Program Management Director Kriss Andrews, and the city’s Chief Financial Officer Jack Martin to the City Council today for what was billed as a Mayoral meeting with the Legislative branch. During a session that lasted less than an hour, Dillon threatened that if the Council does not immediately pass massive restructuring proposals and contracts on the table, the state will withhold revenue sharing funds of $10 million in November and $20 million in December, with the remainder of $80 million in bonds left open to negotiations. 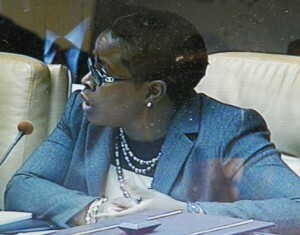 Sandra Hines at City Council session Sept. 25, 2012 on EMA contract. Members of Bing’s entourage were all there as part of a Public Act 4 “consent agreement” the Council approved April 4, allegedly to stave off an “emergency manager” takeover. His entourage did insist that regardless of the PA 4 vote, they plan to move their “reform agenda” forward. Saunteel Jenkins: It doesn’t matter whether PA 4 is voted down. “The city’s financial problems won’t change regardless of the vote Nov. 6,” Councilwoman Saunteel Jenkins said. Bing laid major items on the table with few details and little discussion. Council President Charles Pugh approvingly said Bing had previously visited Council members “door-to-door” to discuss his “reform agenda” in secret. Charles Pugh applauds Bing’s back door meetings with Council members. Contracts on the table for the Council’s Committee of the Whole Meeting Oct. 23 include the Detroit Water and Sewerage Department’s $48 million five-year contract with the EMA Group, which proposes to cut 81 percent of the DWSD workforce. AFSCME Local 207, other DWSD unions held press conference last year to announce legal challenge to U.S. District Court Judge Sean Cox’s Nov. order dismantling DWSD and its union contracts. Appeals Court decision from Oct. 9 hearing is now awaited. In fact, the federal Environmental Protection Agency (EPA) filed a request with U.S. District Court Judge Sean Cox Oct. 12 expressing alarm at the drastic down-sizing proposal and asking for a 45-day halt on any further movement on the EMA contract until the EPA has reviewed it. Cox currently oversees the federal government’s 35-year review of DWSD compliance with the Clean Water Act, which was initiated by the EPA. 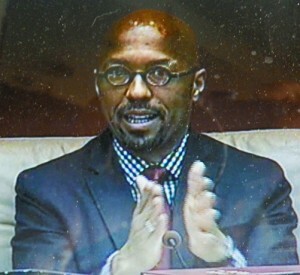 DDOT Director Ronald Freeland (i) is blasted by Warriors on Wheels representative during Council session Oct. 15, 2012. Also cpndemning bus service were members of North End Woodward Community Coaltion and Transportation Riders United. Bing claimed the administration was going to bid out the management contract for D-DOT, currently with Parsons-Brinckerhoff and its subcontractor Envisurage/Transpro. However, D-DOT Director Ronald Freeland is asking the Council to approve new D-DOT contracts totaling $40 million on Oct. 23, including a $25 million contract with Parsons-Brinckerhoff. Its subcontractor Envisurage/Transpro previously employed Freeland as well as former D-DOT Deputy Director Bill Nojay. Nojay departed in August after his ongoing run for office in the New York State Assembly, begun in May, was exposed by The Livingston County News, The Voice of Detroit, and the Detroit News. 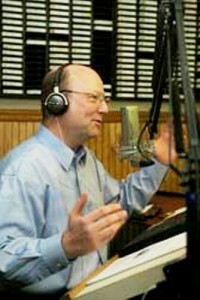 Bill Nojay hosting his right-wing, racist radio talk show in New York. Detroit COO Chris Brown told the press that both he and Bing were aware of Nojay’s campaign. It likely violated the federal Hatch Act because Nojay oversaw D-DOT federal funds. The U.S. Office of the Special Counsel notified the Livingston County News that it had dropped its Hatch Act complaint against Nojay, but recently informed VOD that it is “still investigating” charges VOD filed against Nojay, Brown, and Bing. 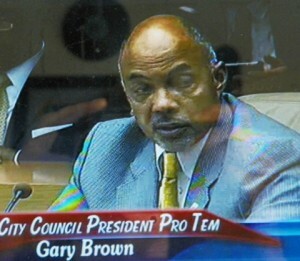 The peripatetic Brown, previously thought by many to be Detroit’s first white “Mayor” since before Coleman A. Young, was not at the Council session and has been little in evidence at public events of late. “We need contracts with operational turn-around firms to collaborate with the Auditor General’s office to examine challenges and overcome management and systems limitations, regulatory limitations, consolidation limitations, and labor limitations,” Bing added. He did not name the companies he had in mind or amounts for those contracts. In response to a question from Councilwoman Brenda Jones, Bing said he wants a one-year renewal of the city’s contract with Ernst & Young, which first claimed the city was running out of money in a secret session with Council in Nov. 2011. 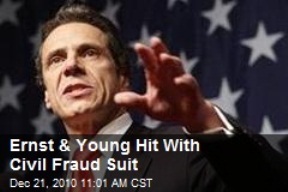 Ernst & Young is being sued by the states of New York and New Jersey because it was the auditor for the Lehman Brothers before its disastrous collapse in 2008. 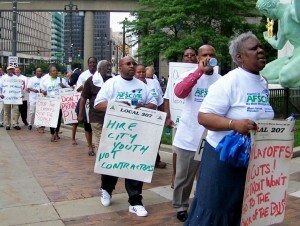 City workers protest privatization, demand city jobs for youth. Bing told the Council he wants the Privatization Ordinance revised, despite last year’s Charter revision vote on a document which still includes the Ordinance, and despite the fact that the city has flagrantly flouted the ordinance for years, according to many union officials. The Miller Canfield law firm, including Attorney Michael McGee, a co-author of PA 4, pushed for the Detroit “Financial Stability [Consent] Agreement” on behalf of Bing at the Council table, and later represented Bing in Ingham County Circuit Court when City of Detroit Corporation Counsel Krystal Crittendon challenged it. 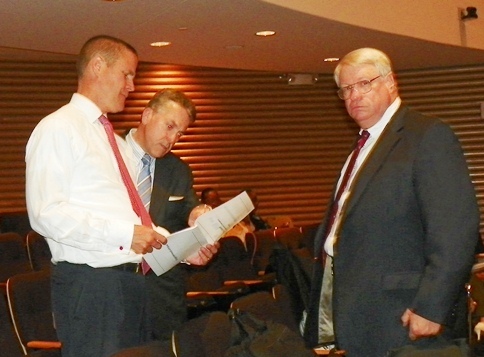 Detroit COO Chris Brown (l) and PMD Kriss Andrews (r) review “City Employment Terms” union-busting document with Atty. 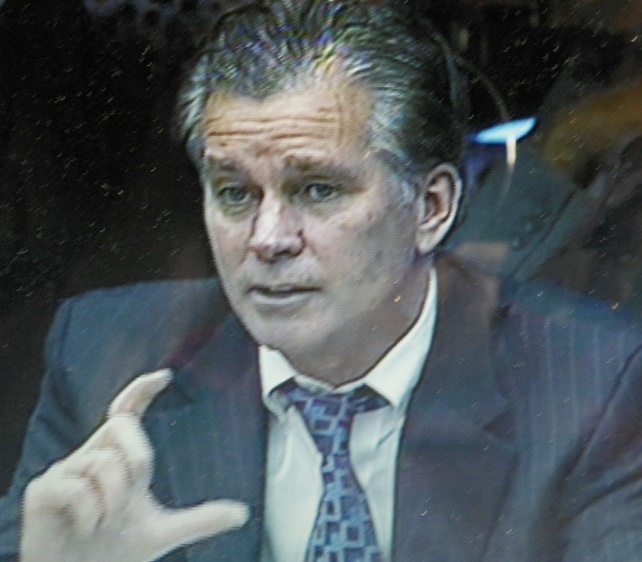 Michael McGee of Miller Canfield before FInancial Advisory Board meeting June 28, 2012. 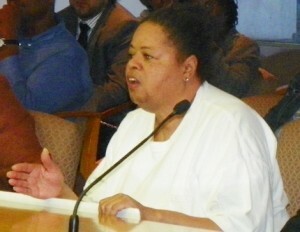 Bing told the Council today that “renewing” contracts with Miller Canfield is also a priority. 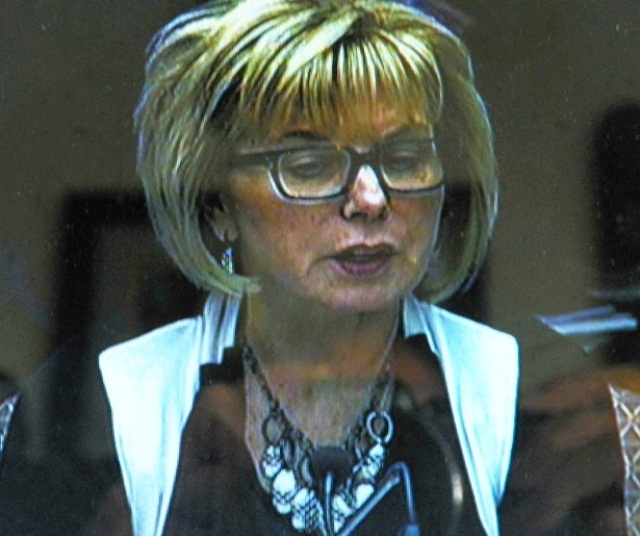 Some Council members said they would vote to do so only if Miller Canfield consults regularly with the Office of the Corporation Counsel, which must approve contracts with outside law firms. That Office has had the proposed contract with Miller Canfield under review since Oct. 16 according to Assistant Corporation Counsel Lewis Smith. Bing also said he wants final approval from the Council on the dismantling and privatization of the Human Services, Health and Wellness Promotion, and Workforce Development Departments. Council President Pro-Tem Gary Brown said that if Bing gets all the proposed actions to the Council in one week, he feels confident they will be approved.